Details relating to the Slovenian Commemorative of 2013. This coin commemorates the discovery of the caves of Postojna 800 years ago. The caves are perhaps the greatest natural attraction in Slovenia and are visited annually by over one million people. The part accessible to tourists is around 20 kilometers long. The motif of the coin is a stylized spiral which represents a cave with two stalagmites. Slightly in from the edge of the inner circle is the inscription : POSTOJNSKA JAMA . 1213-2013.SLOVENIJA. This runs from eleven to five o’clock. 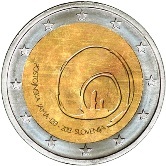 Return from Slovenian Commemorative 2013 to euro coin collector.